Islam is being taught in the nation's public schools as a religion to be embraced because "organized Islamists have gained control of textbook content," according to an organization that analyzes textbooks. The American Textbook Council has concluded that the situation is the consequence of "the interplay of determined Islamic political activists, textbook editors, and multiculturally minded social studies curriculum planners." It has gone so far that correcting the situation now becomes a problem, because "educational publishers and educational organizations have bought into claims propounded by Islamists – and have themselves become agents of misinformation." That comes from Gilbert T. Sewall, who not only wrote the organization's report on Islam and textbooks, but also generated a response to the flood of criticism he encountered. William J. Bennetta, author of The Textbook Letter and a fellow of the California Academy of Sciences, also has documented dozens of instances of advocacy for or against a belief system, and has produced a list of books where the "religion preaching" leaves them "unfit for use." Indeed, Middle East Forum director Daniel Pipes even has repeatedly expressed concern about the "privileging of Islam in the United States" and warns the stakes go well beyond 7th-grade texts. His opinion of Houghton Mifflin's "Across the Centuries? Full of "apologetics" and "distortions." WND recently reported on a case in Oregon, where parent Kendalee Garner objected to having her son being taught Islam, including the memorization of the "Five Pillars" of Islam and dressing up as a Muslim. That episode followed a U.S. Supreme Court decision just a few weeks ago not to review a lower court's ruling that a similar class requirement in the Byron Union School District in California, where students were instructed to "become Muslims" was "cultural education." WND also has reported that a man arrested as a terror suspect for allegedly trying to transport $340,000 from a group tied to Libyan leader Moammar Gadhafi, and who reputedly had connections to Osama bin Laden, helped write the "Religious Expression in Public Schools" guidelines issued by President Clinton during his tenure in office. 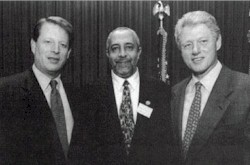 Abdurahman Alamoudi, who was president of the American Muslim Council and a supporter of Hamas and Hezbollah, worked with President Clinton and the American Civil Liberties Union when the guidelines, guidelines later used by a federal judge to conclude such teaching was legal, were compiled. Sewall said in his elaboration that his study showed world history textbooks "hold Islam and other non-Western civilizations to different standards than those that apply to the West" even while "Islamic pressure groups and their allies seek to suppress the critical analysis of Islam inside and outside classrooms." Such textbooks result when "nervous publishers" obey educational fashion and rely more heavily on diversity experts than on trustworthy scholarship, he said. "Textbook editors seem not to recognize that a school-related Islamic agenda in the U.S. uses multiculturalism as a device to guarantee a purely favorable and uncritical view of all things Muslim. At extremes, the report suggested, multiculturalism contributes to a form of peaceable cultural jihad meant to discredit or 'problematize' European civilization in favor of non-Western cultures," he wrote. The ATC describes itself as an independent national research organization set up in 1989 to review the history and social studies textbooks used in the nation's schools. Also contributing to the criticism is the work of Bennetta, whose conclusions are available at TextbookLeague.org. He finds that textbooks from a wide range of many of the best-known publishing houses used in public schools today simply shouldn't be there. "When we examine the textbooks that major publishers try to sell to public schools, we sometimes find fraudulent passages that function as instruments of religious indoctrination: Religious myths are depicted as accounts of real people and events, religious superstitions are depicted as matters of fact, and the origins of religious writings are obscured or are wrapped in outright lies," Bennetta wrote. "These passages of religious propaganda have been devised by individuals or groups that seek to use the public schools for spreading their own sectarian doctrines and for recruiting converts. In various cases, publishers evidently have accepted material from religious pressure groups and have put the material into textbooks, even though it is laden with blatant preaching, miracle-mongering and fake 'history,'" he wrote. 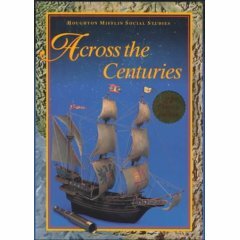 Bennetta, who is equally adamant that no religious beliefs be included as preaching in textbooks, cites a Houghton Mifflin book "Across the Centuries" as having a lot of Muslim "propaganda." He said the 1999 version has one thing an earlier edition didn't: an apparent source. Listed as a consultant is "Shabbir Mansuri, Founding Director, Council on Islamic Education, Fountain Valley, California." Bennetta said the CIE is "a conspicuous Muslim outfit that evidently specializes in inducing schoolbook-writers to sanitize and eulogize Islam, to retail Muslim religious claims as facts, to retail Muslim woo-woo as history, and to depict Islam as an amicable religion that resembles, and is compatible with, Judaism and Christianity." He said other texts and publishers for which he's found a basis for criticism include "Human Heritage: A World History" by Glencoe/McGraw-Hill; "A Message of "Ancient Days" by Houghton Mifflin; "Across the Centuries" by Houghton Mifflin; "Heath World History: Perspectives on the Past" by McDougal Littell; "Ancient World" by McGraw-Hill School Division; "Making Thirteen Colonies" by Oxford University Press, "World History: Continuity and Change" by Holt, Rinehart and Winston; and "World Cultures: A Global Mosaic" by Prentice Hall, among others. Sewall said in his treatise that older textbooks didn't so much misrepresent Islam as neglected and ignored it. Now, those same textbook publishers have moved from ignorance to "self-censorship." For example, a concern raised by Swarthmore historian James Kurth notes "the possibility of structural incompatibility between Islam and the American polity" because of the resistance of American Muslims to assimilate. "These scholars should at least obtain a fair hearing. They do not," Sewall concluded. And, he said, the California-based Council on Islamic Education director Shabbir Mansuri concluded the ATC was an "extremist" organization for issuing a report on such concerns, even though there's no evidence of that. Houghton Mifflin's chief publicist, Collin Earnst, also criticized the report, suggesting that such "bias has misled the public into believing that Islam is a barbaric and murderous religion." Earnst told WND that his company has a careful process for obtaining input on books, reviewing that input, and then deciding what should be published. Where issues of "belief" by a religious group are involved, reasonable citations and attribution are included, he told WND. He said among the groups used for comment in the past have been Hadassah and the Christian Educators Association. But Sewall said there were no such conclusions in his report. "The publisher made these cynical claims to deflect attention from the source of the problem: the textbooks themselves." "In Islam, following the law is a religious obligation. Muslims do not separate their personal life from their religious life, and Islamic law regulates almost all areas of human life. Because of this, Islamic law helped to bring order to Muslim states. It provided the state with a set of values that shaped a common identity. In addition to unifying individual states, law helped to unify the Muslim world. Even though various Muslim states might have ethnic or cultural differences, they lived under a common law." That, Sewall said, "conveys nothing." Further, it never explains that sharia bears "no resemblance to U.S. law, which grew out of the British constitution." Other criticism came from the report's concerns over why Muslims so often don't get along with neighbors. "Looking at Algeria, Nigeria, Pakistan, Indonesia, and the Philippines, for example, where religious wars are being conducted today against infidels, this proposition is more than plausible," Sewall wrote. In the California case that was litigated, Edward White III, of the Thomas More Law Center wondered, "Would it have been 'just cultural education' if students were in simulated baptisms, wearing a crucifix, having taken the name of St. John and with praise banners saying 'Praise be to Jesus Christ' on classroom walls?" From Nyssa, Ore., where one parent raised objections to the Islamic teachings, Supt. Don Grotting, said the text includes assignments for students to learn the "Five Pillars" and study Ramadan. Grotting acknowledged to WND that textbooks do "take a slant" on some issues, because publishers "are wanting to sell a textbook that is meeting the needs of the state and federal mandates." And in the California case, school officials also blamed the "possible cant" of the textbook. Sewall said textbooks in America should "explain the historically potent strain of Islam that promotes separatism and theocracy. Instead, they are trying to trim history to please Islamic pressure groups and allied ideologues. "The implications for U.S. civic education are immense, especially if students are unaware of or even accept the idea that for politically esthetic reasons they are being lied to or emotionally manipulated." "If our nation's cultural underpinnings are in conflict with religious dogma and values that are intent on replacing or even eradicating them, should not children and their teachers be made aware? Just as pro-Soviet enthusiasms, Mao worship, and Cold War revisionism seem na?ve today, currently prescribed views of Islam may also some day seem like dangerous nonsense. And what key points might replace the obvious flaws in the current generation of textbooks? That militant Islam is a real force in the world today, an insurgency that is a real threat to the nation's democratic way of life and freedoms that its citizens often take for granted." "Today, Christmas and Nativity scenes are outlawed while Clinton's nominee, U.S. District Judge Phyllis Hamilton, recently approved 'Islam: A Simulation' where children learn to become Muslim, recite the Quran, fast for Ramadan and pray to Allah including this prayer: 'In the name of Allah, the Compassionate, the Merciful. Praise be to Allah, Lord of Creation, The Compassionate, the Merciful, King of Judgment-day! You alone we worship, and to You alone we pray for help, Guide us to the straight path,'" wrote Jen Shroder, on her BlessedCause.org website. "America does not comprehend Muslim resolve to make America Islam," Shroder wrote. "Suicide bombers have already demonstrated their willingness to kill and die for it." FAIR USE NOTICE: This site contains copyrighted material the use of which has not always been specifically authorized by the copyright owner. We are making such material available in our efforts to advance a more in-depth understanding of critical issues facing the world. We believe this constitutes a 'fair use' of any such copyrighted material as provided for in section 107 of the US Copyright Law. In accordance with Title 17 USC Section 107, the material on this site is distributed without profit to those who have expressed a prior interest in receiving the included information for research and educational purposes. For more information go to: http://www.law.cornell.edu/uscode/17/107.shtml. If you wish to use copyrighted material from this site for purposes of your own that go beyond 'fair use', you must obtain permission from the copyright owner.